Learning to ski is great fun and easy to do no matter how old or young you may be. That’s why skiing holidays are so popular with families – they’re a fantastic experience for everyone involved! However, with so many resorts to choose from, it can be difficult to choose the one that’s going to be most suitable for your family. That’s why we’ve compiled this list of the best family ski resorts for beginners. The hard part is choosing which one to visit first! We’ll leave that decision up to you. North American and Australian/New Zealand piste classifications vary slightly, but green and blue always mean easy and moderate. Black runs, with or without a diamond, will always be the most difficult ones and should be avoided if you are a beginner. Film fans may find this resort to be somewhat familiar – it’s been featured in numerous movies, including ‘For Your Eyes Only’ and ‘Cliffhanger’. Cortina d’Ampezzo’s beauty and fame are not the only reasons why you should visit, though. At Cortina, almost all the slopes are rated easy – intermediate, making it the ideal resort for beginners. You’ll be surprised how quickly you pick up skiing, so it’s always good to a have few moderate and intermediate runs at your resort, as you’ll want to push your skills further once you gain some confidence. The mountain has more than enough slow zones and gentle, easy runs – perfect for you and the kids. 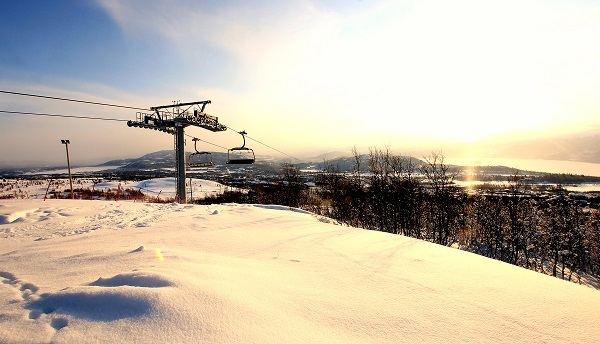 During the first few days, you’ll definitely want to hang out at the Mietres ski area, which is exclusive to beginners. Not only can you practice your skiing here, you can also get used to the lifts you’ll encounter on the mountain. Trust us; you’ll be thankful for the chance to prepare! Once you’re ready to progress, head to the Socrepes area, which can be accessed via a cable car in the centre of town. There are 140 ski runs across the whole resort, so you’re bound to find a new one to try each day. This resort is an extremely cost-effective option if you and your family are new to skiing. There are three free ski lifts at the bottom of the mountain, meaning you don’t need to purchase a lift pass until you’re reading to move further upwards onto the more difficult slopes. This allows you to practice in your own time. Grande Massif is one of the best ski areas for newbies. Here, you’ll be able to ride down a number of short, gentle green and blue runs. There are also two nursery areas for the little ones. We highly recommend that your family goes to ski school – the École du ski Français is fantastic. The school teaches skiers of all abilities and ages, and the instructors are multilingual. No cars are allowed in the centre of the resort, meaning the little ones can run around freely. Plus, all the shops, ski lifts and other services you may need are situated conveniently close to your accommodation. Families with young children who are looking for a skiing holiday that won’t break the bank need look no further than this resort. Set in a quiet, traditional village, Beitostølen is just a 45-minute journey away from the closest airport and four hours from Norway’s capital, Oslo. The mountain has gentle slopes with long green runs ideal for skiers trying to get to grips with the basics. The local ski school is fantastic and all the instructors speak fluent English, so your kids should have a whale of a time. Even if they don’t go to ski school, children under six can get a lift pass for free too. Once you’re all used to your skis and the snow, you can move onto some of the intermediate runs. When you need a break from skiing, there are lots of activities you can all take part in, such as the family slalom race, snow rafting, sledging and mini snowmobiles. Parents will also be pleased to know that the accommodation is close to the slopes – something which you’ll all be thankful for after a long day of skiing. Another great but inexpensive resort is Kranjska Gora between the Julian Alps and Karavanke. The wide tree-lined runs are ideal for beginners and the gentle nursery slopes are nice and close to the village. If there’s anyone in your party who has skied before and needs a bit of a challenge, there are plenty of intermediate runs to keep them happy too. Sometimes on skiing holidays, it’s good for the adults to have some time apart from the kids. The excellent clubs for both skiing and non-skiing children allow you to do just that. Children as young as six months and as old as 12 years can spend some time at the Pepi Penguin Nursery or Whizz Kid’s Club while their parents take some time to perfect their skills on the slopes. If, however, you choose to take your children skiing with you, children under the age of six can use the ski lifts for free when they’re with a parent. Bear in mind that if they are going to ski school, they will need their own lift pass. The excellent variety of beginner and intermediate slopes means you’ll never be bored in Arinsal. It’s just one of the three resorts that make up the Vallnord domain; Arinsal is easily the best place to learn the basics for skiing; Pal is better for beginners and intermediates that want to step up their game, and Arcalis is known for its wonderfully empty slopes. Your Vallnord ski lift pass gives you access to all three resorts, so it’s worth catching a shuttle and giving each a go one day. Don’t worry if you don’t have time though, there are plenty of red and blue runs in Arinsal to satisfy you. If you have kids under the age of 12, you’ll save some money on lift passes, as they are free for skiers up to the age of 11. The ski school is one of the best in Europe and has friendly English-speaking instructors. Thanks to how high up the mountain they are, the nursery slopes the kids will practice on always have great snow conditions. Bulgaria is another great place to go skiing if your family’s on a budget and Borovets is the country’s oldest, most famous and most popular resort. It’s a great place to learn to ski if you’re all complete newbies and the English-speaking ski schools are excellent. In fact, some of the 200+ instructors are former pro skiers. The mountain has 150 snow cannons, so you’re guaranteed to enjoy fantastic skiing conditions all season, right up until April! Many of the runs are wide and tree-lined, making for relaxing and beautiful rides. Most of the hotels are just a short walk away from the lifts, so the kids won’t have too much to complain about after skiing all day. Eating out is inexpensive and there’s a huge choice of restaurants to choose from. The night life is fantastic here too – ideal for any revellers that may be coming away with you. Every bar worker speaks English, so there’s no need to worry about any miscommunications. This is only a small selection of the many great family resorts that best cater to beginners, but you’re sure to find a destination here that suits your budget. Remember that even adults can go to ski school or get private lessons if they want to sharpen up their skills or learn the sport from scratch. At the end of the week, the family can all meet up together to see how much they’ve improved and what they’ve learnt. For further advice, check out our guide to keeping the kids safe on the mountain and our top tips for skiing beginners. Don’t forget to buy the right travel insurance before you go!